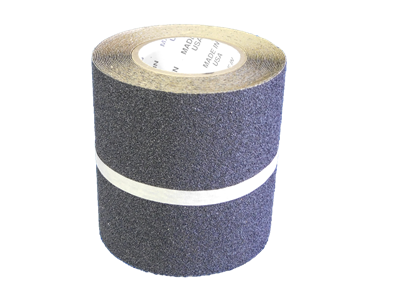 Pressure-sensitive adhesive-backed Flex-Tred® tape sticks to virtually any smooth, dry surface. Cut to length and use only what you need. From carpet cleaners to real estate agents, nobody likes tracking dirt on clean floors or carpets. They slip on AMMEX Shoe Covers. Made of 100% spun-bond polypropylene. Sold in 10 pieces per roll, 10 rolls per bag, three bags per carton, in unisize and XL for size 10.5 and larger. Nylon gloves are woven to be breathable and stretch to maintain the right fit. Nitrile has excellent abrasion and puncture resistance. Combine the two, and get AMMEX Nitrile Dipped Nylon Gloves. Multi-purpose for a variety of work and gardening uses. S-XL, sold 12 pairs per package, 25 packages per case. 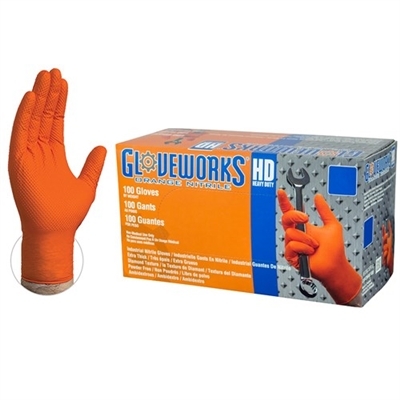 AMMEX Gloveworks HD Orange Nitrile Powder Free Industrial Gloves are designed and engineered to handle the toughest jobs. Their raised diamond texture provides an unbeatable grip by channeling away liquids. Excellent puncture and chemical resistance. Latex free. 8- to 9-mil thickness. M-XXL, 100 gloves per box, 10 boxes per case. Pros don't accept second rate in their toolbox. 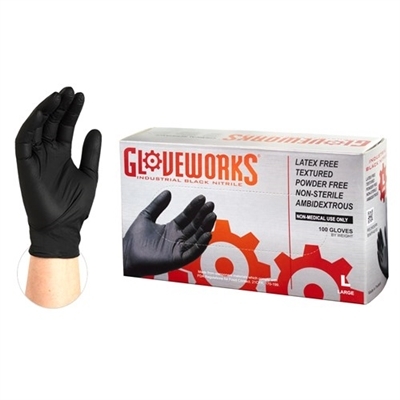 Reach for AMMEX Gloveworks Black Nitrile Powder Free Industrial Gloves for the toughest jobs. More than 50 percent thicker than standard nitrile. Excellent barrier protection and gripping power. Professional black look. Latex-free. Sold 100 gloves per box, 10 boxes per case. S-XXL. The toughest jobs are second nature to you-you always dive in hands first. 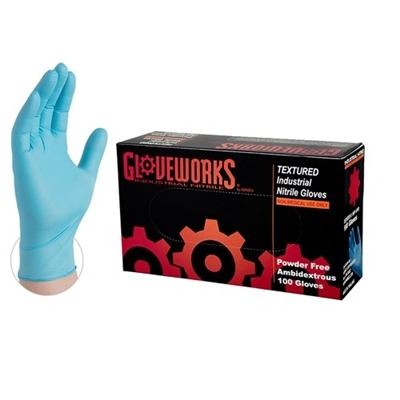 Protect those hands with AMMEX Gloveworks Blue Nitrile Powder Free Industrial Gloves. An awesome combination of strength, comfort, durability, and dexterity. 5- to 6-mil thick, latex free. S-XXL, 100 gloves per box, 10 boxes per case. It's important to use the right tool for the job. Disposable gloves are no exception. AMMEX Xtreme Blue Nitrile Powder Free Industrial Gloves are in the sweet spot between price and performance. These 4-mil gloves offer excellent barrier protection. Latex free. S-XXL, sold 100 per box, 10 boxes per case.